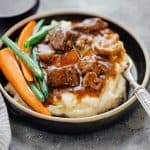 This pressure cooker beef bourguignon has all the flavours is inspired by Julia Child’s beef stew with red wine and has tender, fall apart beef chunks. Easy and fast because its made in an Instant Pot but with the same flavours! We aren’t really big on surprises and are too lazy to plan them. So, on Valentine’s Day, we both sit together for a beautiful meal, and wine and usually talk about how far we’ve come. We aren’t that big on Valentine’s Day either, but I still love the feeling of showing someone I love how much I care, and just taking a day to tell them that they are awesome. This time it’s actually quite special because of all the changes that have happened in our life. 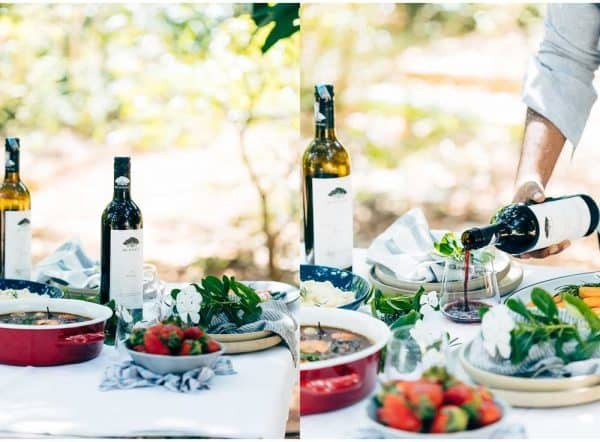 And so, we decided to celebrate each other and our new life by putting together a beautiful lunch out in the garden. This was truly special because it was naturally beautiful – without too much effort. We didn’t have a fancy table cloth, so we folded a white bedsheet, found mismatched table napkins that somehow seemed to go together, some handmade pottery, freshly cut flowers from the garden and a meal that was absolutely perfect! I knew even before we planned this whole thing that I wanted to make a Beef Bourguignon. Something about a French recipe that has meat stewed in red wine just screams romance to me. Paired with mashed potatoes, sautéed beans and carrots and fresh strawberries made this meal so complete and perfect for our lunch together. Beef Bourguignon or as the French call it boeuf bourguignon or beef burgundy is iconic, and my favorite version comes from Julia Child’s recipe. But I made some changes obviously. It’s usually a long process where beef cubes are slow cooked, and beef is stewed in red wine. Some recipes have a really long list of steps but I’m a lazy cook. 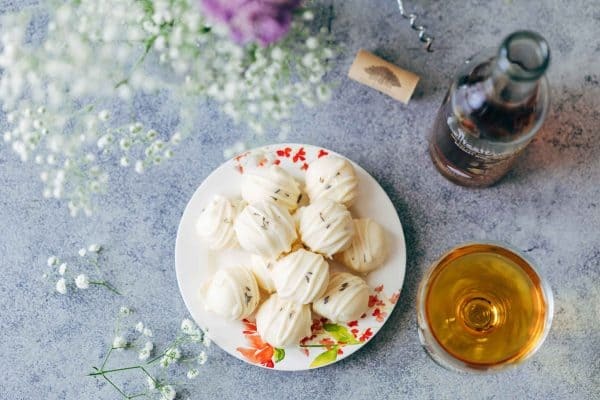 I want the same flavors, but I want to cut down the effort, and I knew I wanted to make this as simple as possible so that you can attempt it at home without giving up mid-way! So, I made my version in the pressure cooker. It starts the same way that every beef bourguignon does where beef cubes are seared on high heat. The bacon and veggies are quickly sautéed and then the pan drippings are deglazed with red wine. But after that, I load everything in the Instant Pot so that instead of 2-3 hours, this easy beef bourguignon recipe is ready in under an hour. I used Big Banyan’s Shiraz for both cooking and serving the meal with. We actually had a choice between Big Banyan’s Merlot and Shiraz for serving, and either wines would work well in this recipe. You want to pick a wine that has a dry mouthfeel so that it doesn’t compete with the flavors of the dish. It’s also really important to pick a wine that you would drink while cooking because while most of the alcohol evaporates, the flavors remain. Which is why Big Banyan wines are so perfect! Also pick a cut of beef that is sinewy and well marbled such as chuck, shoulder or shin. 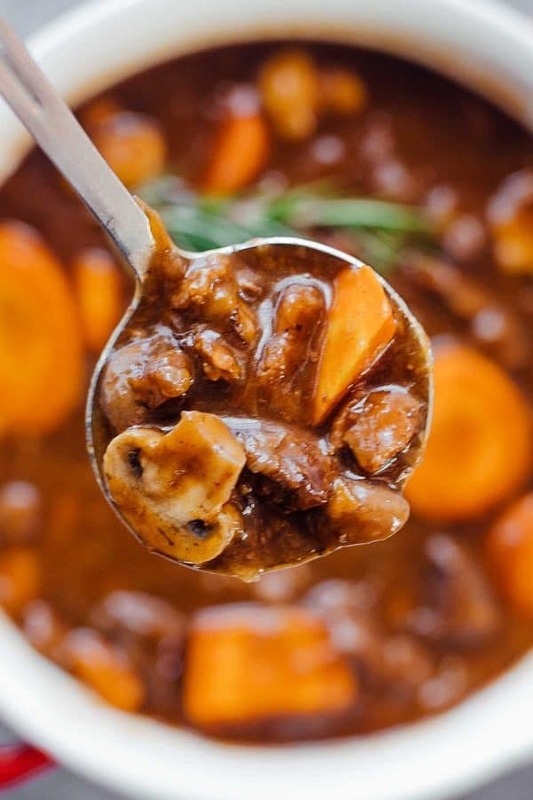 The fat adds flavor and gives this rich and luscious beef stew a gelatinous texture that’s hard to beat. Also, a good pressure cooker beef bourguignon tastes best the next day which is perfect because you don’t actually have to do the work on the same day that you are planning a romantic meal. Just make it ahead, reheat and serve with roasted potatoes, mashed potatoes and even some grilled sourdough. It’s a meal that really says I love you! 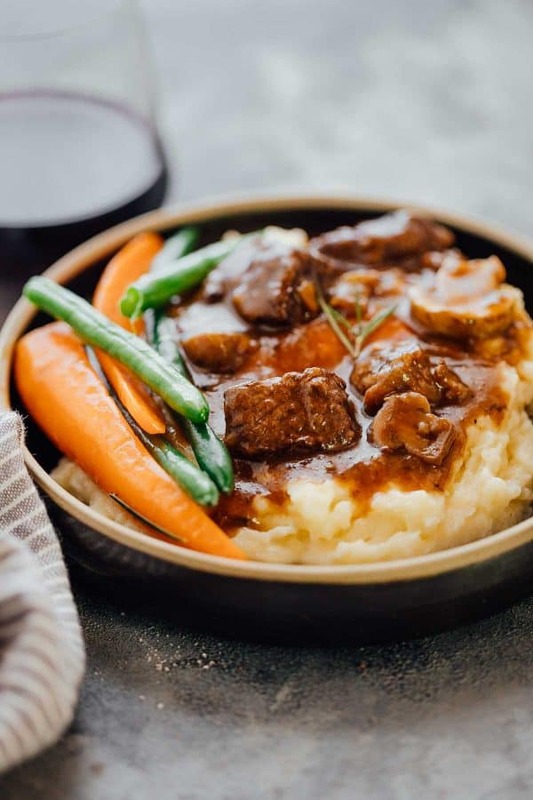 This pressure cooker beef bourguignon has all the right flavours and is inspired by Julia Child’s beef stew with red wine and has tender, fall apart beef chunks. Easy and fast because its made in an Instant Pot but with the same flavours! Sear the beef: In a pan, heat oil and butter and brown the beef on high heat in batches. It’s important not to overcrowd the pan, and keep the heat really high so that the beef browns without cooking on the inside. Once all the beef is browned, set it aside. Saute: In the same pan, add bacon and cook it for 2-3 minutes till cooked, but not crispy. Remove the bacon and blot out half the fat with a paper towel. Add the garlic, pearl onions, mushrooms and carrots and cook on high heat for a minute or two while tossing them around in the pan. Turn on the saute function on the Instant pot and transfer the veggies to the IP. Deglaze the pan: Keep the pan turned on and add half the wine. The wine will start bubbling along the edges. Use a spoon to scrape off the bits stuck to the bottom and simmer for five minutes. Pressure Cook: Add the wine from the pan, beef, remaining wine, broth, thyme, bayleaf, tomato paste, salt and pepper to the Instant Pot. Turn the vent to sealing and lock the lid in place. Pressure cook on Manual for 40 minutes. Once the stew is cooked, release the pressure manually. In a bowl whisk together cornflour and 1/4 cup water. Turn on the saute function and stir in the cornflour mixture. Simmer for 5-7 minutes till the stew thickens. Stir in the bacon and serve this pressure cooker beef bourguignon over mashed potatoes. Cut of Beef: Its best to use sinewy beef that is well marbled like chuck, shoulder or shin. The marbling adds flavour and produces a naturally gelatinous stew because it’s rich in connective tissue. Size of Beef Chunks: I like to cut the chunks into 1.5 inch size because anything smaller shrinks a bit once its cooked and this size keeps the beef juicier. Carrots: Carrots are really optional in the recipe but I love the flavour and you can mash the carrots into the stew as you eat which is just plain delicious! Choose the right wine: Never cook with wine that’s labelled ‘cooking wine’ for this pressure cooker beef bourguignon (actually anything) because its much sweeter and really tastes bad. I would recommend a dry red wine like merlot or shiraz or even a burgundy which is what is used originally in the stew. Don’t ever cook with wine that you wouldn’t normally drink because as the wine cooks down, the flavours come out. Thanks to our friends at Big Banyan for sponsoring this recipe, and serving up some delicious wine! This is an incredible recipe! Thank you so much! What a delicious dinner and so easy to make! Thankfully I noticed the large amount of dried thyme listed in the ingredients and used half as much. Still too much for our taste. Next time, only a teaspoon. Otherwise, the recipe worked. Incredibly flavorful, with a rich and zesty sauce! It was so good, I had to go back for seconds! It was easy to make and the beef was the perfect tenderness. Will make this again for sure, thanks MFS!! Yay! Thanks for leaving your feedback here. Hi! 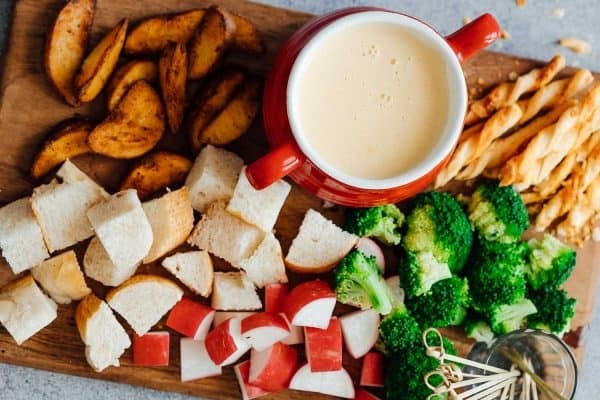 Can this recipe be made using a regular pressure cooker? Can i use goat meat instead of beef for this recepie? Does goat go well with mashed potatoes? Yes, goat meat will probably work, though I’ve never tried it myself! I am always looking for new recipes for the pressure cooker. I made this for my husband and son, I substituted the beef for Venison, since we have an abundance of it at the moment. It was a hit, and I intend to make this again. Followed directions to the letter, Not very flavorful. Hey Tony, can I help figure out why you didn’t like this recipe? Sometimes, when it comes to flavour, just a lack of proper seasoning can bring out the flavours. Nothing that a little salt can’t fix. If there was anything else, I would love to know. This was so good. The whole family enjoyed. Any particular reason you used a separate pan for the browning instead of just using the saute function on the Instant Pot? I find that the surface area on an Instant pot for browning meat is not enough, and the high sides end up steaming it sometimes. You can however turn the saute function on high and brown a few pieces at a time so that they sear instead of steaming. I’ve done it both ways but using a different pan is something that I prefer. Yum! We made this for dinner tonight and it was soooo good. The only change I made was to halve the recipe because I had a bit under a pound of meat. So glad I pinned this! Glad you liked it Heidi! Its one of our favourites too! Hey Sonya – you can substitute the red wine for extra beef broth. I have found that substituting a bit of dark red cherry juice for wine gives recipes the requisite fruity flavor without the alcohol. 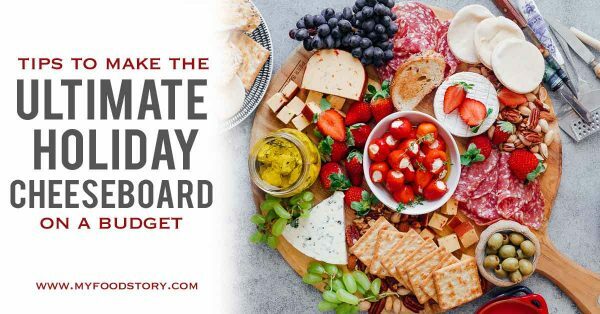 Such a great tip – thanks Stacey! Beef stew cooked in a pressure cooker always turns out amazing. I also tried your recipe and loved the taste. I’ve seen many people make it in a slow cooker but I personally don’t have the patience or the time to wait for it to slow cook. Pressure cooker stew works wonderfully for me on a Saturday night. Slow cooker vs. pressure cooker – I’d probably take the pressure cooker! Glad you liked it Marie! This looks great! Quick question, why do you leave the bacon out until you come back to thicken the stew? Just curious if there would be any issue with leaving it in to cook with the rest. Hey Kelsey – its just so that the bacon doesn’t completely disintegrate and turn to mush, but if you don’t mind that – you can just leave it in and cook it with the rest. Looks wonderful…gonna be trying this recipe for sure. What kind of red is good for this recipe??? Any cheap red wine will do! 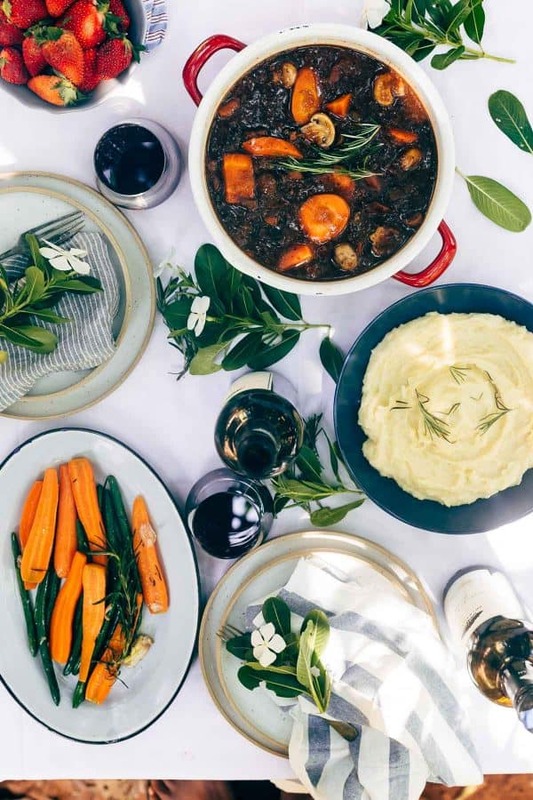 this is the second beef bourguignon recipe i am seeing today and i know its a sign i need to get on it ASAP. love how you guys celebrated lunch out in the nature, so gorgeous! Thank you! It was really special! This looks like such a lovely way to celebrate Valentine’s Day! We like to do stuff like this, too, instead of going out or going too crazy. The beef bourguignon looks so delicious! I love that you give us wine pairings with this recipe!! Nothing fancier than wine and beef bourguignon! Thanks Sandi!